why doesn't that car have LED lights..???? Daniel McCormick and Bond Villain like this. Awesome job for compiling these videos. Personally found them very useful before I test drove and ultimately placed my RS3 order. Foxtrot_Oscar and RYuill like this. Strange in the video it seems to have less of the crackles and pops found on the standard car with a sports exhaust. That's what worries me about a simple remap, it might map out the noise! Nardo looking good have they put spacers on it? that's Daytona Grey TX, is it not.. I have another 2 months until delivery of mine, so am living off videos like this currently! Hope that link works? Is off Facebook..
Yorrick, jimojameso, Snake Pliskin and 1 other person like this. What's meant to be up with the brakes?? 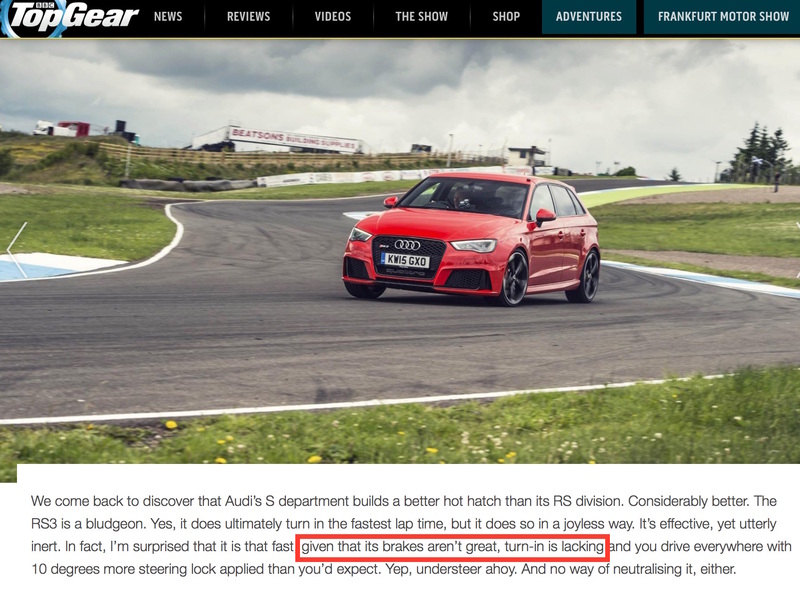 Tongue in cheek, the forum resident troll keeps posting that they suffer from brake fade. I prefer to rely on the testimony of actual owners though! Snake Pliskin, jimojameso, GRE57Y and 1 other person like this. 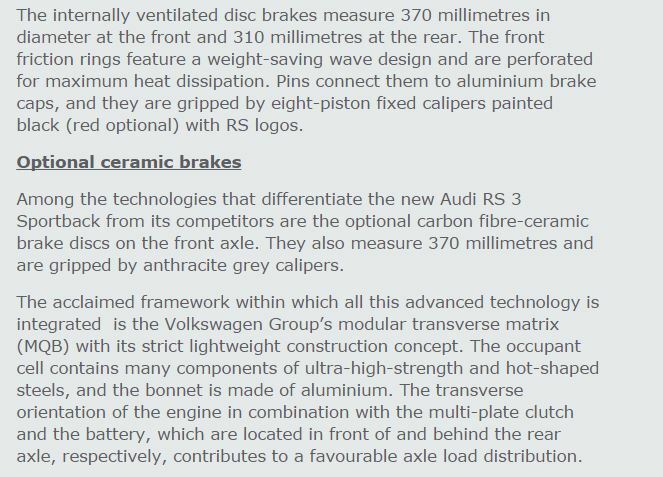 8'32" - "The Audi's brakes are getting hot, and it doesn't want to stop for the chicane"
7'19" - "Golf is better on the brakes and sharper into the apex"
7'33" - "Again, the Golf is better on the brakes into the chicane"
And yes, this characteristic is repeatable (not on a track) on a hard drive cross-country (especially on a hot day). In short - the standard brakes aren't they best characteristic of the car, if you do want to use it to its full potential, consider the carbon option. Will be available evetually, at a dealership near you. No complaints here, from an actual owner, after a good spanking on normal roads. Daniel McCormick, Spaceman_RS3, RYuill and 1 other person like this. Somehow I think I will take an owners word over someone relentlessly quoting third party comment.. So these times are s3? RS3 looses a drag race against a 3 cylinder car and just crosses the line in front of a SUV.